What follows is a report from a resident of Aleppo whose identity is not revealed for reasons of security. Their reports delve deep into the terrorist underworld and expose many of the NGO and media narratives, as propaganda and hypocrisy. We are thankful to these brave, courageous people who bring us the truth from inside Syria, without them we would still be in the dark as to the extent of the terror they are forced to endure day after night at the hands of the US alliance funded and armed mercenary brigades. My sojourn on the Syrian coast was exquisite but too brief, a welcome respite from the hardship in Aleppo. We left Aleppo just before sunrise. The coast is to the West of us but we drove into the hazy sunrise, towards the east. 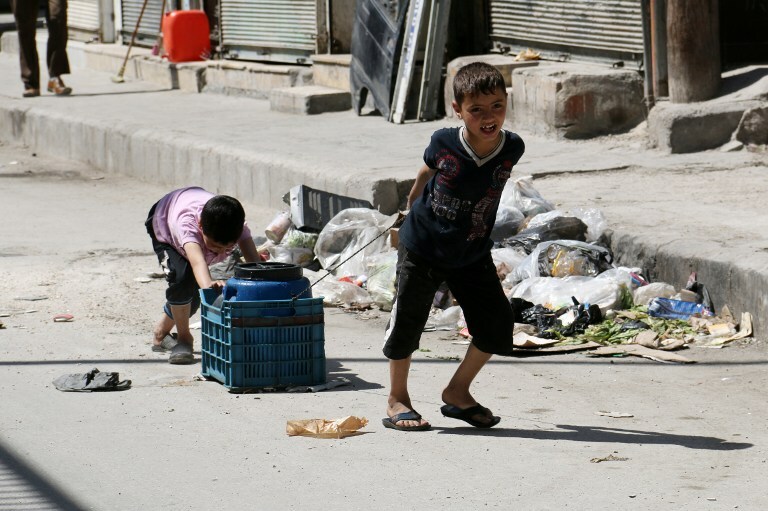 This is Syria, where the crisis has made many things nonsensical. The direct routes and main highways have been occupied and sabotaged by armed terrorist gangs and there is an ever present risk of sniper fire on these roads, so many are best avoided at all cost. As we bumped and rattled along the road, 3 other passengers were conversing with the driver about the “bloody history” of our route. “This is where the terrorists attacked a bus” said one, “there is where the terrorists massacred a Christian family”, said another. “That is where Da’esh targeted a high ranking SAA General” said the driver, pointing at the burned out remains of a car and van on either side of the road, dust covered, eerie reminders of the assassination. It was a sobering experience to travel this road of tragedy with its ghosts of lives taken so brutally and senselessly. The road from Aleppo to Homs, shaped like a mirrored letter C, was the desert road. We went through many fake check points and over rough gravel surfaces that, at one point, resulted in a flat tyre. However, once past Homs the change is extraordinary. The roads to Tartous are in good condition and the closer we got to the coast, the greener our surroundings. This is how I remember the highways in Syria before the “conflict”. This was Old Syria..the one that ceased to exist after 2011. Some Syrian provinces have fared better in the crisis than others, but every one of them has been touched by loss. Not one has been without its casualties in the Syrian armed forces. Tartous, for instance, is considered one of the safest areas in Syria [maybe because of its Russian naval base] but even here, when you enter someone’s house you see the familiar pictures of lost sons, daughters, uncles, brothers, fathers on the walls, paying homage to the brave family members fighting terrorism in far flung provinces. 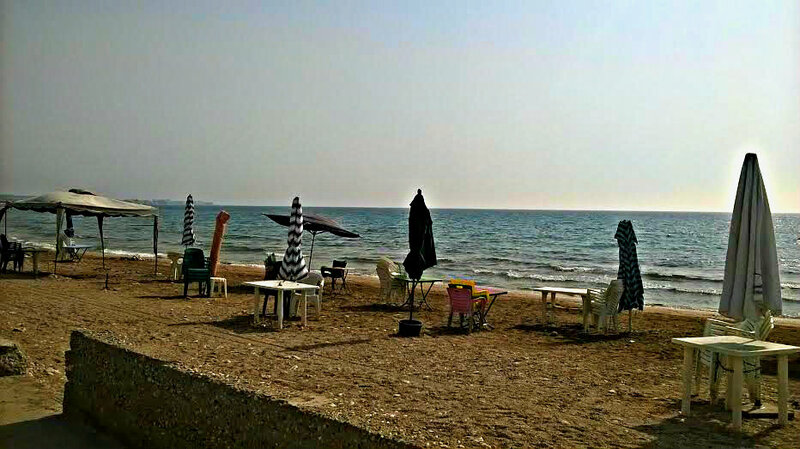 My destination was my teenage haunt of ar Rimal ad-Dhahabiyya [the Golden Sands] about 15km to the north of Tartous City. The resort is secure, with water 24/7 and electricity, maximum 15 hours per day. I was even able to turn on the air conditioning, an unheard of luxury in Aleppo. Internet reception is excellent, again in marked contrast to the limited 3G reception in Aleppo. Rimal is a reminder of Syria before 2011. Peaceful ambiance, laughter, dancing, bikinis, parties. A typical Mediterranean resort, far removed from the ravages of war. A cosmopolitan gathering of Syrian families without bombs, rockets or mortars to shatter their joviality. Hijabs mingling with bikinis on the packed beaches. 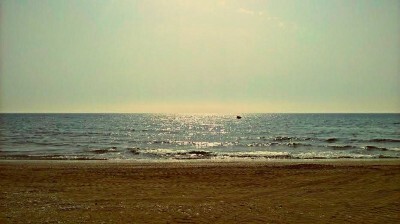 The peaceful early morning beaches, Rimal. The only flares in the night skies came from celebratory fireworks not from terrorist rockets or mortar fire. Here you could see Christians and Muslims from many different sects sitting side by side in friendly camaraderie. None of the sectarianism being described in Western media, none of the religious judgementalism. I did stumble upon several demolished chalets that closely resembled the bombed structures in Aleppo and elsewhere in Syria. 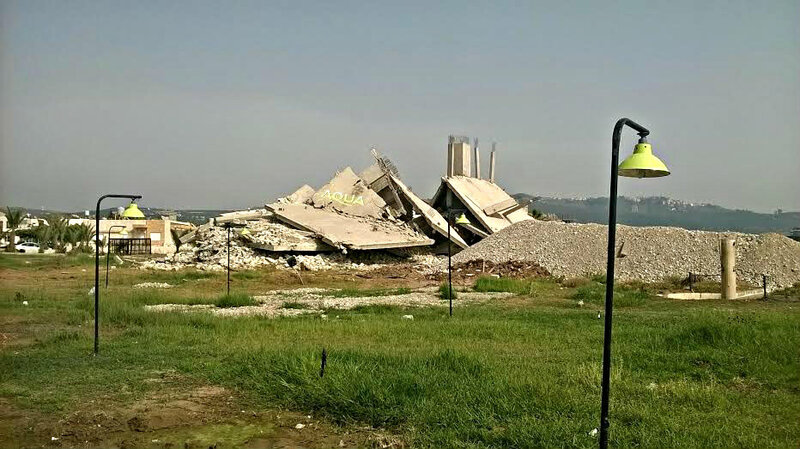 In reality, the local municipality had demolished them because they were an eyesore and had been erected illegally by the corrupt resort manager. I couldn’t help thinking that they might still appear in an HRW tweet or in Western Media with the caption of the ubiquitous barrel bombs that are being blamed for everything. I would certainly not put this beyond the “rebel” propagandists. I do know that photos & videos from Rimal have been used by the “opposition” to claim that Syrians & the Syrian Government are rejoicing in the deaths of their countrymen. One of my relatives informed me that nobody had celebrated in the resort for the last four years out of respect for the suffering in Syria. For the first time this year, they felt that they needed some relief from the intensity of the struggle and to remember the good old days in Syria when unity and peace were the norm. So let the terrorists mock our happiness, we have had enough of the sadness and sorrow that they have imposed upon us. Life became a series of indulgences during my time in Rimal. Delicious food, beautiful balmy nights, swimming in the warm sea with my nephews and nieces [although jellyfish were a less palatable hazard]. I had to laugh when at one point, I bumped into a group of elderly men and women discussing politics in the shallows. They were even criticizing the government quite openly and stridently without “reprisal”. I can’t tell you what a luxury it was to have a shower and an air conditioned room. How quickly did I forget the showers in Aleppo, a large cup and a washbowl! All too soon, my time in paradise came to an end and after 6 days we were heading back to Aleppo. On the way back, I noticed that the C-like road between Homs and Aleppo had changed, even in such a short time. As quickly as the Government were trying to asphalt roads in some areas, the terrorists were bombing them at night to create new craters and crevasses, forcing drivers back onto the gravel roads. However, I can proudly say the Government was winning even this battle. There were more newly asphalted roads than sabotaged ones. 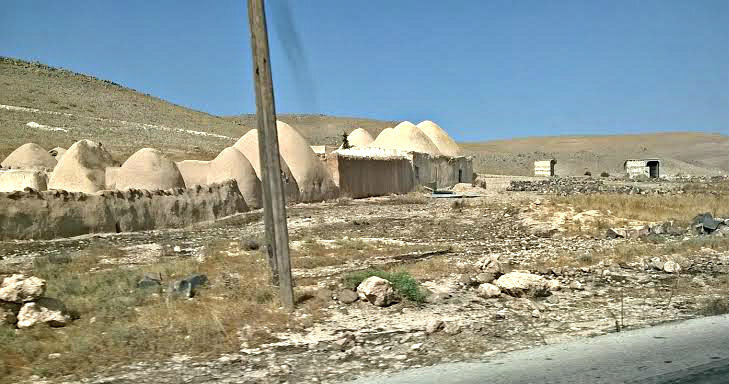 I did manage to take some photos of the Aleppo province villages alongside that arid, remote highway. These villages are famous, with their mud conical roofs, a typical feature of these village homes. Originally they would have built miniature versions for birds, chickens and small domestic animals but over time they had evolved into human dwellings. I remember seeing old WW11 and even WW1 archive videos showing Australian troops marching among these conical roofed houses, military motorcycle riders stopping to give the locals a pillion ride for fun. Now these homes are deserted and abandoned, their inhabitants forced to flee inside or outside Syria, refugees from their own lands. Returning to Aleppo after such a delicious transportation into Syria of old, made me reflect on one important aspect of Aleppo, Queiq or Koweik, Aleppo’s river. A thousand years ago this river fortuitously burst its banks in the winter and swept away the Crusader camps who were besieging Aleppo. In the summer its flow dries to a trickle that is the source of jokes and local proverbs. The river lost much of its importance decades ago when Turkey built a dam at its source reducing flow into Aleppo & diverting its waters into Turkish territory. The river was reduced to a dry valley, distinctly malodorous in the summer. This ensured the loss of all the species of fish that had been documented by western scientists and historians centuries before. Turkish-Syrian relations had improved in the decade prior to the crisis to the extent that the Aleppo river basin had been converted into a series of canals dotted with beautiful bridges, illuminated at night. With the advent of the crisis, however, the tide literally turned. The river formed a natural border between terrorist held eastern Aleppo and government held western Aleppo. The river became the terrorist dumping ground for dead bodies, massacred by the terrorists not by the government as depicted in western media whose sole aim was & still is, to demonize the Syrian government. A couple of years back, the terrorists were sending young kids to buy huge amounts of bread supplied by the government to feed the people of Aleppo city. Once purchased, this bread was callously dumped in the river resulting in a crippling bread shortage for a long time. Eventually the government managed to round up the culprits and imprison them. I don’t have to tell you how the media portrayed this activity but the truth is, it was necessary to ensure the people of Aleppo didn’t starve. The terrorist held areas in the East receive all the water from the Euphrates but they can’t store it all, so they have solved this issue by pouring thousands of litres of clean water into the filthy, contaminated water of Queik which is, of course, undrinkable. This is not all, the Red Crescent is then pumping this filthy water into huge cisterns which is piped to the taps that people are using to fill up their water containers. The Red Crescent is claiming that the water is clean and only needs chlorine tablets or boiling to purify it. They ignore the fact that the river has been a dumping ground for dead and decaying corpses, stale bread, sewage and a myriad of filth and rubbish over the last 4 years. Their actions in supplying this water to residents are indefensible, their claims that it is safe are criminal. Those capable of dumping bread and clean water into a contaminated river to prevent half the city from eating the bread or having clean drinking water are committing heinous crimes against humanity. I am not sure if it is a “war crime” as such but they are the real “infidels” if there is any real meaning for this word that they bandy about so liberally. They are not “freedom fighters” or “moderates” that NATO and their allies are supporting so vociferously. We are suffering from lack of water, we go thirsty while they are intentionally squandering it. I watch, heavy hearted, as the elderly and children patiently wait in endless queues in the searing heat to fill their assorted containers. I see them having to lug these heavy containers through the narrow alleyways, struggling under the weight as the precious water splashes into the dust beneath their feet. I feel nothing but rage when I see these thugs and criminals on the other side of the city pouring thousands of litres of clean, fresh water into the disease infested river under the noses of the thirsty Syrians they are claiming to liberate. They are the terrorists, they are the monsters in this story and they are committing daily mass crimes against the citizens of Aleppo but this is never mentioned by the western media. Are we not Syrian? Does our plight mean nothing, does our story not count? This is Aleppo, the real Aleppo, not the western media fantasy, this is our sleeping, waking, perpetual nightmare of life under terrorist occupation.